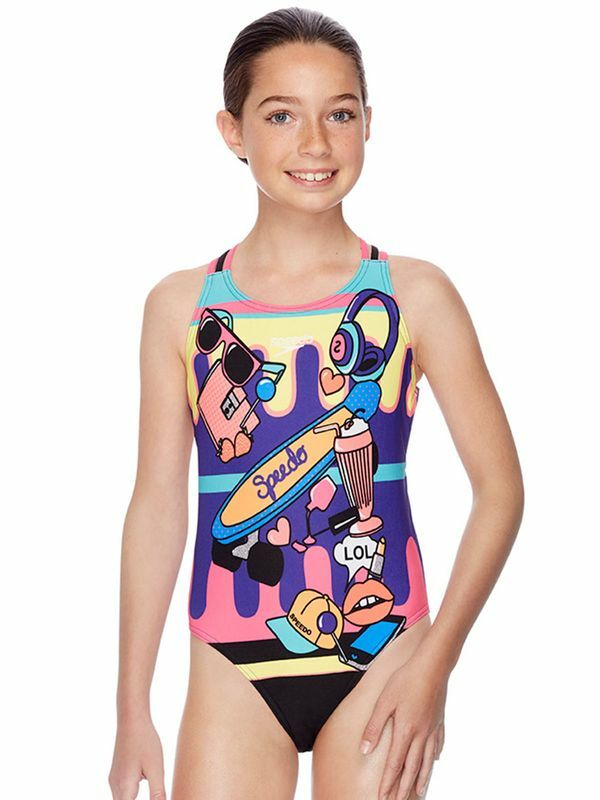 On the search for an ultra cool and modern style, you are going to love the Speedo Girly Fun Triple Crossback Girls’ One Piece! With a trendy emoji inspired pattern of sunglasses, kissy lips, nail polish, milkshakes, and all things that girls love, this vibrant one piece is an explosion of colour. With magenta and slate accent straps in a fun triple crossback and a coconut white Speedo logo, this one piece has it all. As soon as you get your hands on the Speedo Girly Fun Triple Crossback Girls’ One Piece, you’ll know why Olympians around the world love this impressive brand. Girly Fun Triple Crossback Girls One Piece manufactured by Speedo Swimwear the worlds leading swimwear brand. Speedo is passionate about life in and around the water, creating revolutionary new technologies, designs and innovations.